The work smelt great as well, really clean and fresh. Not the most important aspect about the art on display, but I imagined these art piece in the future like the Bayeux tapestry being repaired with bright turquoise thread. The work embodied the same magnitude. It was grand and impressive. Would the smell change and would the brightness of the threads dim? The scenes of modern society were glorified and triumphant in Grayson’s ‘piss taking’ of social classes. The surface was perfect and exciting, but this perfection seemed to disengage me somewhat. Was it because the surface seemed clogged with a heavy uniformity of mechanical stitching? Did the artist’s hand still penetrate through the work? Perry’s style was evident in his stylised drawing and text and his interpretation and embodiment of cliched social classes. I thought, yes, it is about him or rather about us? I was running low on battery but took a few close ups of the work. Grayson walks the line between craft and fine art and in my opinion, successfully bridges the gap. However, I am conditioned to ‘quiver’ between the two, knowing that they are viewed and valued differently. 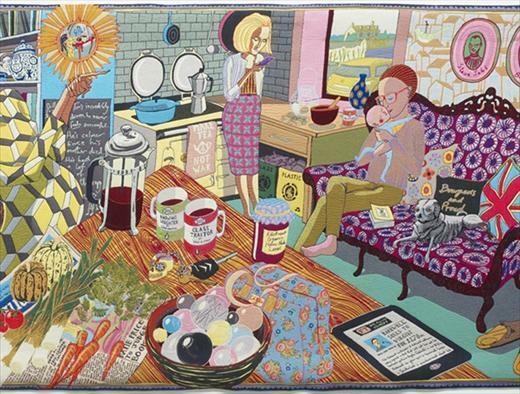 Is it that Grayson Perry works with traditional craft processes with a fine art concept? Moreover, a craft artefact may not have underlying meanings and only embody function and form? Or can craft objects also embody meaning, but only through a symbolic use in traditional and cultural practices? Grayson’s meanings and messages are so literal though. It is bursting with signifiers and symbols, text and tokens. The work becomes a time capsule, preserving the fleeting and transient moments in modern day culture in a labour intensive artefact. Grayson’s work is different, as it catches on something, that is both metamorphically smooth and rough at the same time. His work is silly and great, he worships a teddy bear! but what is wrong with that? It is like he has warped the values and the cultural norms and made you notice that the way things are, can equally be another way too. If this is absurd, then who cares?